After the upgrade from Windows 7 or Windows 8.x, your copy of Windows 10 should be activated and genuine. But, some users report that they received an activation error 0xc004f034, so they weren’t able to activate the product. I prepared a list of possible solutions for this problem, and I hope at least one will help you activate to Windows 10. 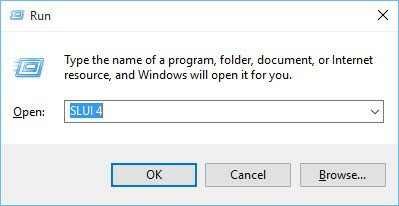 Why does Windows 10 error 0xc004f03 occur? Error 0xc004f034 is not some sort of critical error which tells you that you won’t be able to install and activate Windows 10 ever. It’s just Microsoft’s message saying that Microsoft’s servers are not accessible at the moment. It was especially the case in first couple of days of system’s availability, because servers were overloaded, due to a huge number of downloads, but it could eventually happen even now. But you don’t have to worry about it, because the problem will solve itself, you just have to wait until the servers are available again, and you won’t have any problems activating your operating system. On the other had, if you don’t want to wait, there are a couple of things you can do to force the activation of Windows 10 right now. echo Activation was successful. Press any key to close this window. Check if your Windows 10 is now activated. If the .BAT solution didn’t work, you can try the following: Go to Settings > Update & Security > Activation, and then click on Activation button repetitively. I know this sounds ridiculous, that’s what I also thought, and I spent a lot of time thinking about if I should include this as an actual solution. But, a lot of people are actually reporting that this worked for them, and that they were able to activate Windows 10 after hundreds of clicks on the Activation button. So it must be some kind of bug within the system, and Microsoft will probably resolve it in the future. If you’re using one of these tools or all of them, temporarily disable them while updating your operating system. Keep them turned off during the activation phase as well. Open a new Run window and type SLUI 4 > hit Enter. A new Windows 10 activation error should appear on the screen. Simply select your country and hit Next. Follow the on-screen instructons and call one of the numbers available to contact Microsoft Support. This solution is particularly useful if your activation issue was triggered by incorrect PC’s settings, hardware issues and other problems on your end. That’s it, I hope you’re able to activate your Windows 10 after running some of these fixes. As I told you, maybe you won’t need to do anything, as the activation process will be available once Microsoft’s servers are accessible again. But if you’re still unable to activate your Windows 10, tell us in the comment sectionbelow. We’ll try to find another solution for you. We Answer: Can I Clean Re-Install Windows 10 After Upgrading?